The Pine Mountain Trail has 16 named designated backcountry/backpacking sites. Most of the sites are located about every 2-3 miles or so along the 23 miles of the main Pine Mountain Trail. Grindstone Gap is located on the white blazed Sawtooth connector trail and Little Bridges Campsite is located on the Chestnut Oak Trail. See Site Descriptions for where all the sites are, how many backpackers each will hold etc. If you have not been to our trail you may want to order/buy a map of the trails to review first of all. Our topo-style PMT trail map (New & revised 2019 Edition) is available by US mail for $5.00 and can be ordered through the on-line store. The map is printed on Tyvek. Maps are mailed free to Scouts and groups (schools and churches) along with active military folks by mail from the PMTA only. Since we send groups/military maps FREE, we do have to limit those to two per group or one per individual please. NOTE: if you forget and leave your map at home and arrive at FDR State Park without it, you need to purchase/buy another. They are NOT free at the park office. Note: when we reply we got your request, we will email you some information to please read over before coming on the trail. CLICK HERE to order free maps if you are eligible. Using it, you can judge how far you may want to walk in and out for a backpacking trip. For map orders see Maps of the Trail on this website. After you get a map, you may want to call Jim Hall with the Pine Mountain Trail Association (706-569-0497) for information on planning a backpacking or hiking trip. bag and colored copy of a handout which contains the basic park rules for backpacking. To see the handout click here. More information on backcountry permits is available here. Shuttles for backpackers and hikers are not regularly available from the park or the PMTA at this time. However contact the PMTA via email or see our Facebook page, as sometimes there are those who can do shuttles at various times. NOTE: Turtle Hollow has one fire ring and will hold a group up 30+ but is usually permitted out to large groups. Sassafras Hill at times has little to no water nearby depending on season and may be noted as a dry camp and NO campfires there (stoves only during that time). Same goes for Whiskey Still Campsite and Grindstone Gap. NOTE: Unless you find or bring in about 5 gallons of water to drown the campfire, no fires at these marginal water available camps. Check with FDR Park Rangers and office clerks when you register at the park office for information on the current water situation and possible fire bans. The FDR State Park office is open 8:00 a.m. - 5:00 p.m. Monday-Thursday, 8:00 a.m. - 8:00 p.m. on Friday, and 8:00 a.m. - 6:00 p.m. on Saturday and Sunday. Backcountry permits are not issued within two hours of dark. Once you get your backcountry permit, it is a good idea to call home and let someone know which site(s) you will be at and where you are parking, along with your tag number. Relatives etc. who can’t reach your cell phone can call the park rangers in an EMERGENCY ONLY by calling at 706-663-4256 (this is a 24 hour number) or 706-801-5006. You must camp in the site you have a permit for and need to park where you indicate on the backcountry permit. Should you decide to not stay at a site (due to sudden illness or weather conditions etc), call the park rangers or go by the park office and let a clerk know. See, if it is early enough in the day, that site you had a permit for may be permitted out to others who otherwise might have to be turned away. There is also a safety concern: should you leave the park without notifying the park office, the park rangers would have to take the time to try and contact you by phone or possibly institute a search for you not knowing why you didn't show up at a site. Please, be considerate of all involved. The PMT gets a lot of Boy Scouts and other groups who use our hiking trail and backcountry sites. There is some additional information on this website under SCOUTS AND GROUPS. If you are a group/organizational or scout group and use the trail often,, we encourage you to join the Pine Mountain Trail Association. The BSA Backpacking merit badge requirements for staying 2 nights and covering 15 miles can be met by using our main trail along with connecting loops and backcountry sites. Simple work or service projects on the trail can be arranged by calling in advance Jim Hall at 706-569-0497. The most popular/busiest months are January-April and then September-November, with March and October being the two most used months overall. Reservations are HIGHLY recommended. See PERMITS on this website. If you don’t have reservations, call the park office to check availability or come early as you can on weekend days as permits for backcountry sites may be available for some non-reserved sites. PHONES: Cell phones are advisable to carry on the trail, however, in some low areas some may not get out. EMERGENCIES ON THE TRAIL: If you have an emergency (i.e. medical situation, lost or turned around) and need help, contact the FDR Park Rangers FIRST! The park is located in Harris and Meriwether counties and if you call 911 you may not get the proper 911 center. Let the FDR Park Ranger help you and get medical help if needed to you by calling 706-663-4256 (24 hours). In addition to the main 24 hour number, FDR State Park also has a Google Voice number. If you do NOT reach the rangers on the 706-663-4256 voice number, by dial the Google Voice FDR ranger urgent number 706-801-5006. You can leave a short message and return phone number and it transmits/sends the message as a TEXT message to the ranger on duty. Given the limited cell service in some areas of FDR, rangers can often get a text message when voice calls do not go through. Carry a map and know where you are when you seek help. If lost, try to relay where you started on the trail or try to relate your last known location/landmark. PLEASE use the above numbers for urgent needs only. If you have an information or map question, call the FDR office at 706-663-4858 during business hours. WATER: Available at most sites and in several places noted on the map with a W. All water must be purified, filtered, or boiled before drinking. FOOD SUPPLIES: In Pine Mountain, there is the Corner Food Store (next door is a KFC and Subway) at US 27 and GA 354 and a IGA supermarket downtown. 10 am till 3 om, we suggest the Whistling Pig Café for BBQ which is .2 of a mile North of the 354/US 27 intersection…..
​CAMPFIRES: Small campfires are allowed only in the established fires rings most times in the 16 named campsites only (when there is NOT a fire ban on). Please do not build new fire rings or move existing ones. Keep fires small so as not to blaze up and impact overhanging limbs and leaves. Use only dead, downed wood. No axes or large knives like machetes are allowed in the Pine Mountain Trail backcountry. Careful use of a small saw is permitted, but do not saw down or on dead trees or green ones. Per park rules: trees of any size are not to be cut on or down for any reason in FDR State Park. If you cannot find any dead wood, use your stove. Please do not bring charcoal, wax fire-starters, candles or fire-logs, as they will not burn up completely. Please put your fire out before bedtime (we often get some winds during the night). 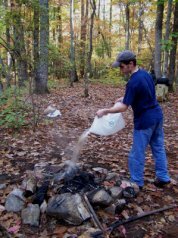 When leaving the campsite in the morning, make sure the fire is out by drowning it by pouring water on it till the steaming stops. Don’t think just because you let the fire die out at night there are no smoldering coals left in the morning. Drown it to make sure. PMTA volunteers and park managers have found a number of smoldering campfires. Having a campfire is a privilege not a right. If more smoldering fires are found, the park managers can put a total ban on campfires! So do your part so we can have safe campfires and follow the guidelines above. Find a fire smoldering, warm? Drown it and report it to the park office that day. Violators (those who leave a campfire smoldering) can be issued a citation. Step 1: drown campfires with several gallons of water. Step 2: stir the coals. Step 3: pour on more water until the steaming stops. If you have any firewood left, stack it neatly for the next campers. Please do not try to burn glass containers, cans, plastic items or aluminum foil. If other campers did, please put them in your trash bag to carry out. Leave the campsite looking better than you found it. TRASH: Plan on carrying out and home all your trash, including cans, foil, glass or plastic. These items will not burn. When you get a backpacking/backcountry permit, the park office clerk has a free for asking a trash bag. Trailhead trash cans are located only at Dowdell Knob Trailhead and the WJSP-TV tower parking lot. 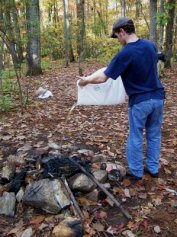 If you find trash at a campsite, please be better than the previous backpacker and take their trash out too. 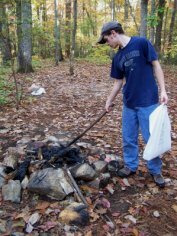 NOTE: if come to a camp that has a lot of trash around or in a fire ring or find a smoldering fire, report it right away to the FDR rangers. When you have to "go" or "go poop": On the back of our map it states "Bury human waste at least 100' from the trail and 200' from campsites". When you need to "go poop", with the heal of your boot/shoe, scrape back some leaves/straw and some dirt then "go". Then cover the waste and the toilet paper only** with the leaves/dirt. Girls/females who use toilet paper even to just urinate, "go" then cover the paper as requested above. ** If girls/females have non-paper items (ie: tampons/and cardboard or plastic covers and pads/liners and plastic bags), be prepared and bring a Ziploc bag and treat those like trash and put the Ziploc bag in your personal trash bag and take out off the trail and dispose of in a trash container (if there is one at a trailhead) or at your home. ONLY toilet paper and human waste is acceptable to be left covered in the woods to decompose. ALCOHOL: Consumption of alcohol (beer, wine, or liquor) of any type is against Georgia State Park rules. You cannot drink anywhere in FDR State Park except inside of a rental cabin. Thus, no drinking on the trail or at backcountry campsites anytime or at picnic areas. WEATHER: Weather conditions at FDR State Park can be found on the Weather Channel website and using zip code 31822 or by calling the local NOAH Weather number. Note the night time low showing will about 5 degrees cooler up on the mountain. In warmer weather, sudden wind and rain storms come across the Pine Mountain ridge. Be prepared.